...I guess what I am getting at with [sweater knit] fabric is it isn't something you can lay out and put the pattern pieces on and cut away. You have to really think about your fabric in regards to whether it is a panel fabric or has regular type fabric widths, how they are going work with the pattern you want to use or maybe won't work. Yes, that's a very good way to put it. But then, placing a sewing pattern on a sweater knit isn't too different from laying out a sewing pattern on a woven fabric with a one-way design or on a fabric with a nap. And just as with surface design or a design woven into the textile, it's always necessary to consider the whole project before any cutting takes place. For my next sweater I'm using cotton fisherman knit fabric in four panels. 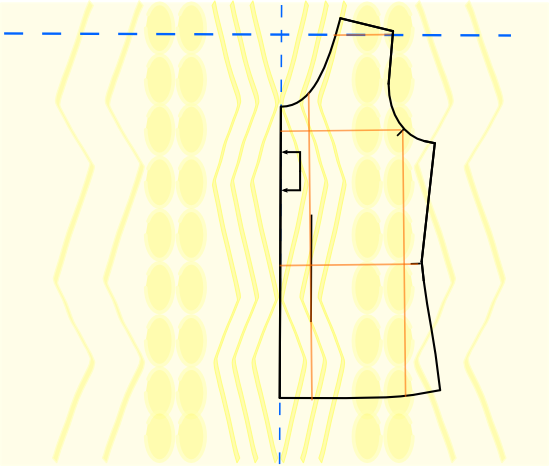 (Panels = fabric pieces of a fixed length and width, as opposed to fabric that's been cut off a roll or bolt to a requested length and a fixed width.) When I do work with a length of fabric with a standard width, I still only work with one section of fabric at a time, enough for one pattern piece. I'm very careful to keep the rest of the fabric length (that's still attached) rolled up, never allowing any of the fabric to hang off the table. Whether the fabric is striped, an unbalanced plaid, a high contrast jacquard, or a textured Aran, there are various approaches to getting patterns to match on the sweater. It all starts with the cutting. I've modified the way I do this over the years. One thing that hasn't changed is that I always cut through a single thickness of fabric. Once I've determined how I'd like the design to sit on the garment, the following is how I lay out the first pattern piece of the sweater. In this case, it's the front. Step 1. With a pencil and a marking ruler with guide lines, draw lines parallel and perpendicular to the marked grainline. Step 2. Choose the "top" of your fabric (the part where the shoulders are) and how you'd like your design to lay on the sweater. 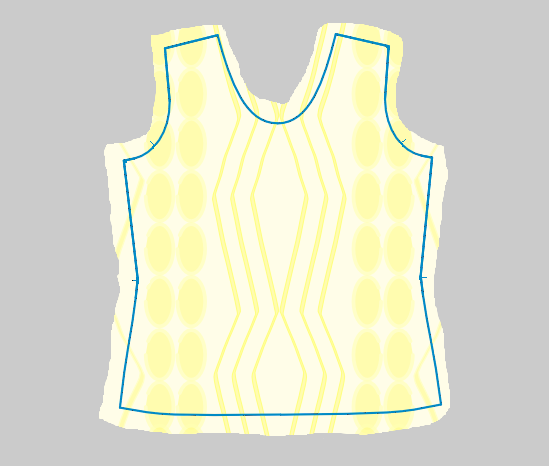 A top must be designated with many knit fabrics. Plain jerseys and simple rib fabrics can usually be used in either direction. Be sure to stick with your designated top of the fabric throughout the project, unless you're making a particular design choice. I prefer to work with the wrong side of the fabric up if the design is prominent enough on the wrong side for me to see what I'm doing. This way I feel freer to make marks on the fabric. Step 3. Mark what will be the center line on the fabric and mark a line perpendicular to the center line near the top or at another important area of the design. 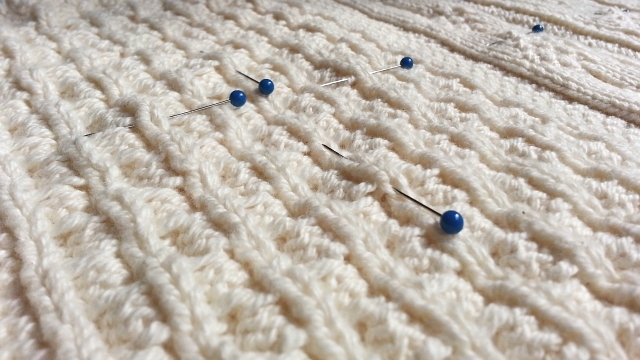 Use pins like in the pic at the very top of this page or (if working with wrong side) your favorite tailor's chalk or erasable marking pen to mark the lines on the fabric. Step 4. Place first piece back on the fabric. Pin paper pattern in place or use good weights. Step 5. Extend drawn in pattern lines onto fabric with pins (or with disappearing marker). Adjust fabric as needed so that paper pattern and design are square. 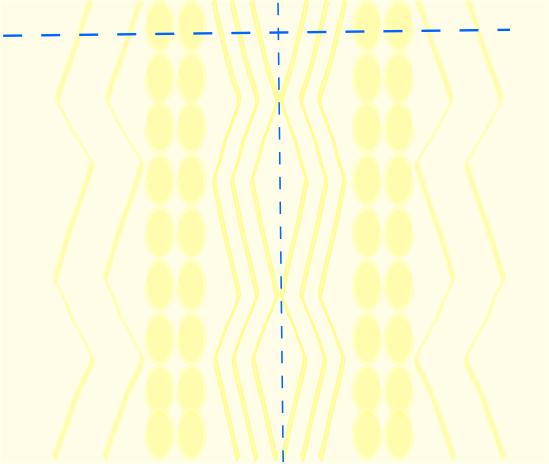 This fabric design has a built-in vertical element so no more vertical lines had to be drawn. 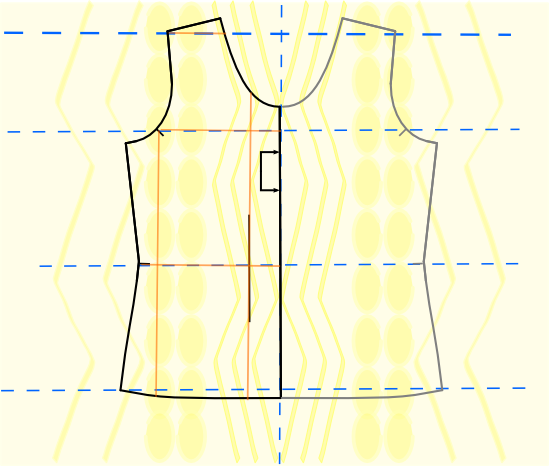 Because of the fabric design, it may be necessary to follow a rib or wale in the fabric and mark more vertical lines than just the center line. Step 6. With a chalk or marker, trace the outline of the the paper pattern onto the fabric. Step 7. Remove pin or weights from paper pattern, flip pattern to opposite side of center line, adjusting fabric so that both sides match. Pin or weight paper pattern in place. Step 8. Trace the 2nd side as in Step 6. Step 9. Cut your piece out. I'll be thread tracing by sewing machine, so my piece will look something like the diagram above. 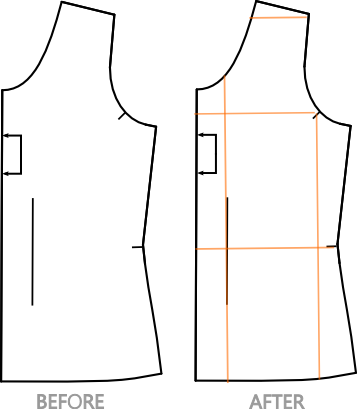 Yours may have neater seam allowances because you're cutting the actual cutting line provided by the sewing pattern. (I'm just doing a quick, sloppy cut to be trimmed later. After cutting I immediately bring the piece to the sewing machine and do a long basting stitch on the outer edge of the sewing lines that I've marked. Presser foot is set to light pressure. The basting stitch will help keep the fabric from stretching or running. Knowing where the sewing line is will help immensely in the next step, too.) I'll be using this first piece as a guide to match the fabric pattern when I lay out the pieces for the back and the sleeves in a future blog post Matching the Texture or Color Patterns in a Cut and Sew Sweater. I'm hoping this doesn't sound tedious. I actually enjoy the process and love trying to get things lined up just right. If you have any tips or variations that you use, please share them in the comments. We all want to know! If you have any questions or corrections or need a clarification on any my steps, please let me know. Now as soon as I make up my mind on the exact sweater I'll be sewing, I can go ahead and complete Steps 1 through 9! This is wonderful news, good instructions!! I'm glad you found it helpful, Tamara.